October 6 – 7, 2018. Saturday, 10 a.m. – 5 p.m. Sunday, 10 a.m. – 4 p.m. Mother Lode Quilters’ Guild Presents “Golden Threads” Quilt Show. Mother Lode Quilter’s Guild. 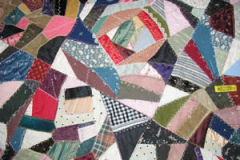 The upcoming Golden Threads Quilt Show in Sutter Creek will have approximately 200 quilts on display, including a Crazy Quilt made in 1892 here in Amador! This historic quilt, discovered by chance by one-time Sutter Creek resident Debbie O’Neill at a yard sale in Mokelumne Hill, was found crumpled up on a table, dusty and dirty, but comprised of colors that immediately appealed to Ms. O’Neill. She purchased the quilt for about $10 and took it home to use as a Christmas Tree skirt. 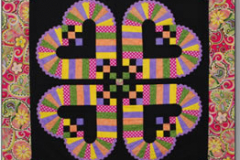 At a historic quilt show in Sacramento’s Crocker museum many years later, Ms. O’Neill enjoyed the museum-quality quilts on display, including the Crazy Quilts that were popular at that time. That’s when it occurred to her that the tree skirt may be a treasure. For the first time, she laid the quilt out and took a good look at it. 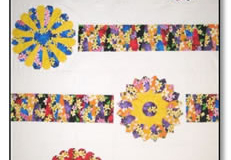 The quilt was an authentic “Crazy Quilt” which were immensely popular in the late 1800’s as a result of the English embroidery and Japanese silks that were introduced at the Philadelphia Centennial Exposition. Ms. O’Neill’s quilt was dated 1892 and there were 3 sets of initials all ending in “K.” With the help of Elaine Lackey at the Amador County Records, Ms. O’Neill determined that Z.K. was Zadie Kephart and B.K. was Birdie Kephart, two teenage sisters from Plymouth, California. Ms. O’Neill was hooked and continued her investigation on the creators of her quilt. An 1896 a news article from the Amador Dispatch described the New Year’s Eve Masquerade ball that Zadie attended, wearing a chrysanthemum constume. Ms. O’Neill continues to search out stories of Zadie and Birdie, giving more background to her marvelous historic quilt. 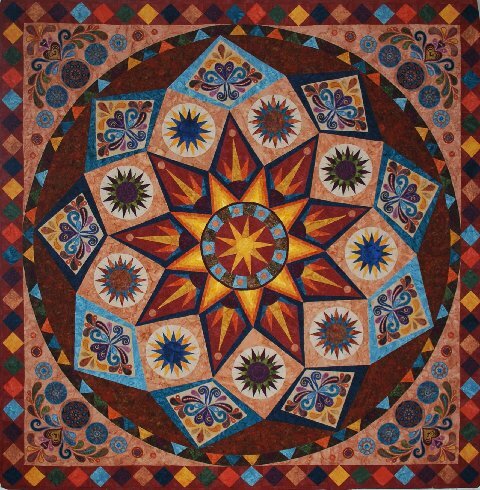 In addition to the many traditional, contemporary, and art quilts on display, the Golden Threads Quilt Show will also have a quilt appraiser, Nancy Bavor, an American Quilt Society certified Appraiser. Ms. Bavor can provide written appraisal for both modern and antique quilts, something that is often required by insurance companies if a quilt is lost, damaged, or stolen. She is also the Curator of Collections at the San Jose Museum of Quilts & Textiles. 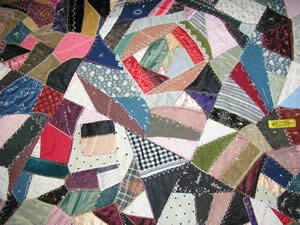 Quilt appraisals are $50. Information on how to get your quilt appraised is described below. 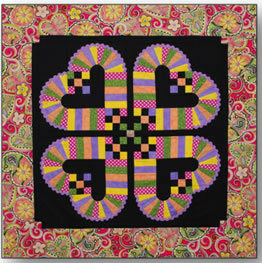 The featured quilter is Marcia Harmening of Happy Stash Quilts. Originally from Alaska, Marcia uses bright and colorful fabrics to brighten the snowy and monochromatic days of the long Alaskan winters. Her original designs are modern and take full advantage of the bright colors she uses. 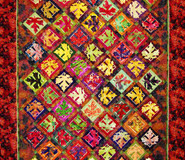 Marcia has devised a new quilting technique called Flip and Fuse which makes possible the intricate designs in her patterns so easy. 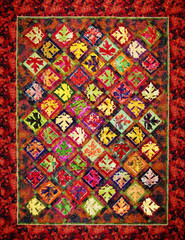 In addition to a book entitled Flip and Fuse, the Tahoe Collection, Marcia has also written I Love Color and Sew Red. She travels throughout the United States teaching her techniques and showing her beautiful quilts. She now lives in Reno, Nevada, enjoying the abundance of sunshine. The Mother Lode Quilt Guild (MLQG) was formed in 2003 by a group of quilters who were looking for a guild that met in the evenings. After only 10 years, the MLQG has 55 members. The guild meets at 6:30 at the Sutter Creek United Methodist Church on the 4th Monday of every month. As a non-profit organization, MLQG is very active in Amador County. Comfort quilts are made by guild members and include baby quilts, cradle quilts, pillow cases, and special quilts for seniors. These quilts are made from scrap fabric donated to the guild. Sutter Creek Quilt EventThe funds raised by the Golden Threads Quilt Show are used to support local charities, such as Foster Family Services, Half Way Ranch, Amador Humane Society, Amador Pregnancy Help Center, Amador STARS, Interfaith Food Bank, Sutter Amador Hospital, and Operation Care. 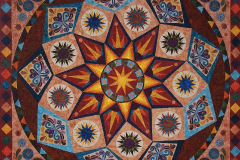 For more information about the Golden Threads Quilt Show, contact Anelie Belden at 209-296-7059. 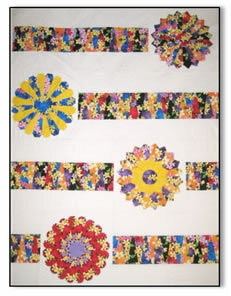 For more information about the Mother Lode Quilter’s Guild, visit http://motherlodequiltersguild.com. To schedule an appraisal, contact Terrie van Syoc for appointment: terrievs@yahoo.com or (209) 296-5104.